Today's rental market continues to grow more competitive, with national vacancy rates for rental housing hitting their lowest point in 10 years in the first quarter of this year, U.S. Census Bureau data says. "A shift from owners to renters has caused rental vacancies to keep going down even more," says Jed Kolko, chief economist of listing service Trulia, of the new shape of the market. The rental vacancy rate dropped from 9.7 percent in first quarter 2011 to 8.8 percent in first quarter 2012, Census Bureau data shows. The drop was accompanied by a decline in the homeownership vacancy rate -- which measures the segment of the housing inventory which is vacant and for sale. It fell from 2.6 percent in first quarter of 2011 to 2.2 percent in first quarter 2012. The fall in the rental vacancy rate highlights a continuing shift in Americans' living habits from homeownership to renting, and follows in the wake of a housing crisis that has put around 4 million Americans out of their homes, and trapped more than 10 million people under the weight of mortgages that exceed the values of their properties. Speaking to the fallout from the bursting of the real estate bubble, the new U.S. Census Bureau data also showed that the homeownership rate reached its lowest level since 1997 in the first quarter of 2012. 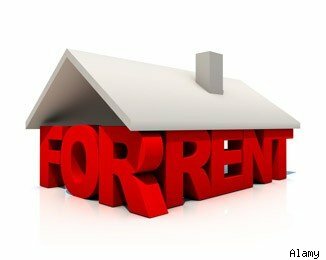 The inflated demand for rentals also has driven up rental rates. In fact, buying was more affordable than renting in 98 of the nation's 100 largest metro areas as of February, Trulia's rent vs. buy index said. The "renting process will get more stressful as people are chasing after a smaller number of available units," Kolko says. 'As vacancy rates get lower, rents rise because you have people competing for fewer available units"
The rising rental demand won't reverse course anytime soon, Kolko says, since many people who could save money by buying rather than renting are still unable to qualify for mortgages due to strict lending standards. Steve Halpern, a senior associate Realtor at New York brokerage CitiHabitats is witnessing the frenzy of rental activity firsthand, and he says that pressure on renters to act fast and pay high rates isn't likely to ease up anytime this year: Landlords will continue to capitalize on growing demand by jacking up rates, by the Realtor's estimation. "They're going and hitting people with raises, but those people realize the raises are happening everywhere, so they're staying put," Halpern says. With particular attention to the unique challenges posed by the current market, Halpern offers some tips that may give you a leg up in today's rental hustle. 1. Be flexible about location. Naturally, the places where people want to live most are going to be the toughest areas to get a deal, so try to be open to living in neighborhoods that aren't as mainstream as you might like. "Most people come in and say, 'I need to be in a particular area, and those areas are generally the tightest," Halpern says. 2. Allow more time for your search, but be prepared to pounce. Since you're competing with so many other apartment hunters, be prepared to give yourself a little more time to hone in on a rental that meets your needs. Find a Realtor whom you trust to help you identify windows of opportunity, Halpern says. When they arrive, seize them immediately. "You gotta catch an apartment as it comes up," Halpern says. "You have to be prepared to move quickly." 3. Have your paperwork on hand (or maybe we should say "in hand"). That means proof of income (often in the form of a letter from your employer), your last two years of tax returns and a recent pay stub, for starters, Halpern says. If you're at an open house with 20 visitors, acting fast could mean the difference between winning and losing. Having your paperwork on hand will enable you to increase your odds of success when you know you've found a good deal. 4. Know your credit, be ready to explain blemishes. "Knowing where you stand credit-wise can really make a difference," Halpern says. If you have credit blemishes, offering an honest and upfront explanation may help you stand out from the crowd. After all, in today's market, chances are that landlords will find out if you're hiding anything and won't appreciate uncovering information that suggests you misrepresented yourself to them, Halpern says. "They prefer you being honest and upfront," Halpern says, "so you can justify to them what has happened." 5. Consider moving in earlier than planned. If you're willing to sign a lease that goes into effect even just a week earlier than you'd planned, you may significantly increase your appeal to a landlord. Landlords want to fill vacancies quickly, so they're looking for renters who are willing to begin paying sooner than later. "They're going to want you in there as soon as possible," Halpern says. 6. Be willing to pay a higher rate than advertised. If you really think you've found a place that's right for you, offering to pay a slightly higher rate, even just $25 or $50 a month more, Halpern says, could work in your favor. The draw to landlords is pretty straightforward: "They're in business; they want to make as much money as possible."